For those who don’t know – what’s Busy Gang? 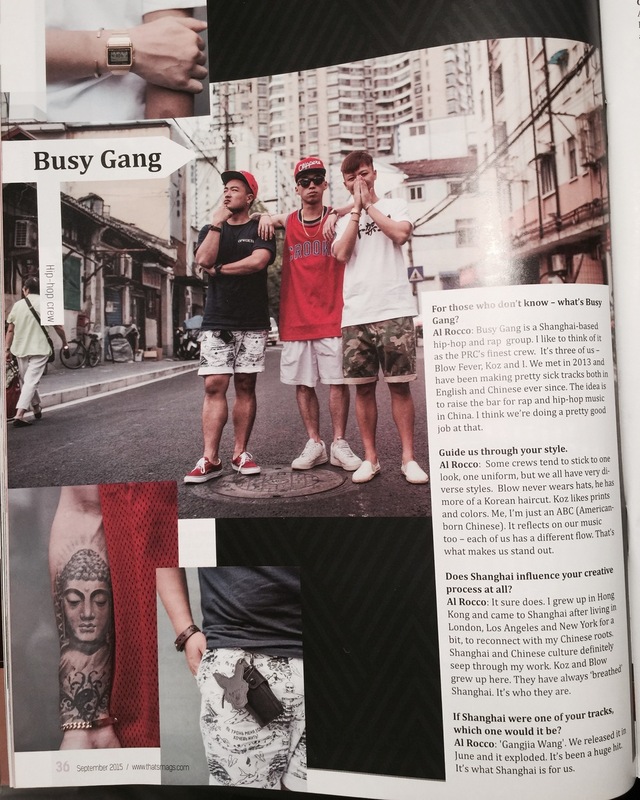 Al Rocco: Busy Gang is a Shanghai-based hip-hop and rap group. I like to think of it as the PRC’s finest crew. It’s three of us – Blow Fever, Koz and I. We met in 2013 and have been making pretty sick tracks both in English and Chinese ever since. The idea is to raise the bar for rap and hip-hop music in China. I think we’re doing a pretty good job at that. Guide us through your style. Al Rocco: Some crews tend to stick to one look, one uniform, but we all have very diverse styles. Blow never wears hats, he has more of a Korean haircut. Koz likes prints and colors. Me, I’m just an ABC (American-born Chinese). It reflects on our music too – each of us has a different flow. That’s what makes us stand out. Does Shanghai influence your creative process at all? Al Rocco: It sure does. I grew up in Hong Kong and came to Shanghai after living in London, Los Angeles and New York for a bit, to reconnect with my Chinese roots. Shanghai and Chinese culture definitely seep through my work. Koz and Blow grew up here. They have always ‘breathed’ Shanghai. It’s who they are. If Shanghai were one of your tracks, which one would it be? Al Rocco: 'Gangjia Wang.' We released it in June and it exploded. It’s been a huge hit. It’s what Shanghai is for us. @BeatsByDre #StraightOutta Hong Kong 香港 with Sam Lee 李璨琛, Phat 陳偉雄 & Kit 梁永傑 (LMF 大懶堂) & Al Rocco.